From bountiful blueberry pancakes to our piled high pulled pork, we are sure to satisfy your breakfast, lunch & dinner cravings! We are grateful to work with our local vendors and partners to provide you with, all natural and sustainable local produce and ingredients. It's our promise to freshness! We proudly smoke All Natural Meats in house, daily over Hand Cut Hickory! From an office party, to an at home celebration, we can help with your next event. 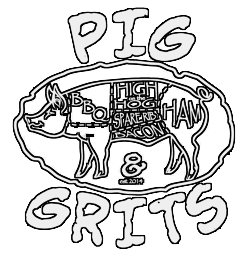 Let Pig & Grits cater to you & for you!